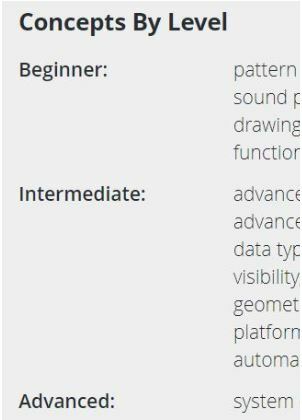 If you’re an educator who uses Tynker, you already know that Tynker provides grade-specific coding curriculum integrated into Computer Science and all subject areas, with a focus on giving a path to learning and achieving concept mastery. But did you know that now, if you’re a district administrator, you can assess, at a glance, exactly how your investment in this platform is impacting your teachers and students? Tynker’s new District Dashboard empowers administrators to gauge the adoption, usage, metrics, outcomes and concept mastery in a granular and relevant way. No longer do you need to wonder about the value and return on investment you’re getting with Tynker! This tool sets Tynker apart from other platforms where such data may not be available to administrators. Most STEM programs do not largely have any great mechanisms for tracking results or achievements. Too often, school STEM programs have to resort to observation or STEM showcases in order to show progress. With the Tynker District Dashboard, now district administrators can view realtime progress and achievements; not just for one classroom or teacher, but across the entire district, with one click. When your district makes a purchase, you want to maximize your ROI. For substantial purchases, observation or ‘engagement’ isn’t a big enough metric to make a decision for a year-over-year investment. Tynker’s District Dashboard metrics make achievement transparent. The dashboard shows data for the entire time your district has held a Tynker license, so you can see, historically, how involved a teacher or school has been with Tynker. With this information, you can better support less-involved teachers through technology facilitators and other resources. With our ‘Concepts by Level’ graphic and metrics like ‘Teachers By Student Concept Mastery Level,’ you can easily gauge usage and content mastery across all students, teachers, and schools in the district. Acknowledge high-performing schools and inspire others to rise to the occasion! The data in your District Dashboard provides clear talking points to use in discussions about Tynker with stakeholders, such as other administrators, parents, community members, and fund-granting entities. Now, you can easily quantify and point to student outcomes across your district–a functionality not available with other coding platforms. Ready to take a look at your new District Dashboard? View your dashboard by simply signing into tynker.com with your usual login credentials. Concept Mastery At the bottom of your dashboard, you’ll see a graphic that explains exactly what concepts students understand in each of three levels: Beginner, Intermediate, and Advanced. As you navigate through ‘Metrics,’ ‘Locations,’ ‘Teachers,’ ‘Students,’ and ‘Classes,’ you’ll see these levels referenced; the ‘Concepts by Level’ graphic will help you better understand the information you’re viewing. Metrics Under this tab, you can see a variety of data segments. Each segment is designed to help you see different kinds of data so you can target support appropriately and fully maximize your investment in Tynker. For example, one available segment is ‘Teachers By Total Student Projects.’ This enables you to see, at a glance, how many student projects each teacher has helped facilitate. If some teachers seem to have fewer student projects than others, that might suggest that additional support or professional development is needed in order for those teachers to more fully take advantage of the licenses. 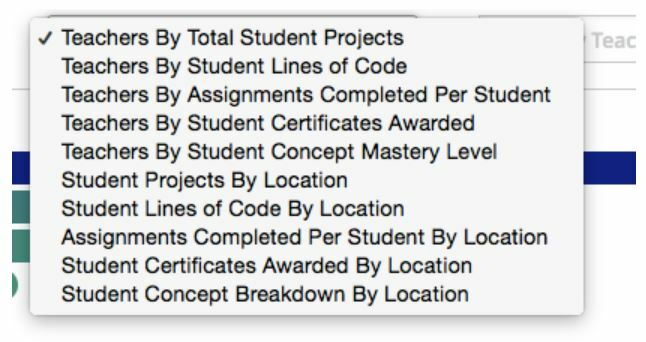 Another segment is ‘Student Certificates Awarded by Location.’ Here, you can see how many student certificates have been awarded at each school in your district. A certificate indicates that students have met key learning milestones, such as lines of code completed, number of projects created, or number of courses finished. Other metrics include ‘Teachers By Student Lines of Code,’ and ‘Student Concept Breakdown by Location. Both of these allow you to quickly gauge to what degree students are learning coding principles and engaging in coding activities in each of your district’s locations. The next four tabs– ‘Locations,’ ‘Teachers,’ ‘Students,’ and ‘Classes’–allow you to quickly view the number of student projects generated per location, teacher, student, and class in your district, respectively. Under the ‘Licenses’ tab, you can easily view details about the licenses you have purchased for your district. In addition to viewing this information on your dashboard, you can also use the Export button at the bottom of your dashboard to export data as CSV files for further analysis. As a school administrator, you balance many responsibilities as you contribute to students’ successful learning experiences. Relevant data helps you make well-informed decisions about what tools work best for your students. This data is vital as you make funding decisions year-over-year and have discussions about Tynker with key stakeholders. We’re excited to launch this new district dashboard so that you can more efficiently partner with teachers and other stakeholders to help students in your district have real success with coding. Sign in to Tynker to see your NEW Tynker District Dashboard!